Polaiteoir, náisiúnaí agus réabhlóidí Éireannach ab ea Constance Gore-Booth, níos deireanaí an Chuntaois Constance Markievicz (4 Feabhra 1868 Londain – 15 Iúil 1927 Baile Átha Cliath). "An Chuntaois Dhearg" a thugtaí uirthi mar gheall ar a cuid tuairimí sóisialacha. Áirítear ar laochra náisiúnta na hÉireann í.
Saolaíodh Constance Georgine Gore-Booth i mBuckingham Gate i Londain, agus b'é Sior Henry Gore-Booth, an taiscéalaí Artach, a hathair. Bhí sí ar an iníon ba shine sa teaghlach. Murab ionann agus formhór mór na dtiarnaí talún in Éirinn, ní raibh Sior Henry ag dúshaothrú a chuid tionóntaí. Mar sin, más amhlaidh féin gur bean uasal ab ea Constance, d'fhoghlaim sí trócaire agus daonnacht i leith na mbochtán agus í ag fás aníos. Bhí eastát an teaghlaigh, Teach Lios an Daill, suite i gContae Shligigh in iarthuaisceart na hÉireann. Chuaigh Eva, deirfiúr Constance, le gluaiseacht an luchta oibre agus le gluaiseacht na mban, a bhí san am sin ag troid ar son chearta vótála na mban. Bhí an bheirt acu cairdiúil le William Butler Yeats, an file, agus é ag teacht ar cuairt go minic. D'fhág a chuid smaointeachais a lorg ar shaoldearcadh na ndeirfiúracha i leith na healaíne agus na polaitíochta. Theastaigh ó Constance dul leis an ealaín. Sa bhliain 1893, chuaigh sí ag foghlaim ealaíontóireachta i Scoil Slade i Londain. Ina dhiaidh sin, thug sí aghaidh ar Pháras, áit ar casadh an Cunta Polannach-Úcráineach Kazimierz Markiewicz (Casimir Dunin-Markievicz) uirthi. Ealaíontóir ab ea é agus baint aige le teaghlach uasal saibhir Polannach, ach bhí sé pósta cheana féin nuair a fuair sé aithne ar Constance. Sa bhliain 1899, áfach, cailleadh a bhean chéile, agus phós sé Constance sa bhliain 1901. Mar sin, rinneadh an Chuntaois Markievicz di. Chuir siad fúthu i mBaile Átha Cliath sa bhliain 1903, agus bhain an Chuntaois clú nár bheag amach di ag dathú pictiúir de thírdhreacha. Sa bhliain 1905, bhunaigh Constance Club na nEalaíontóirí Aontaithe le gairm scoile a chur ar lucht ealaíon Bhaile Átha Cliath ar fad. San am sin, ní raibh baint dá laghad ag an gCuntaois le haon chineál polaitíochta, gan aon trácht a dhéanamh ar an bPoblachtachas. Ansin, sa bhliain 1906, thit rud éigin amach a thug uirthi saol na n-ealaíon a thréigean ar mhaithe leis an náisiúnachas Éireannach. Sa bhliain sin, fuair sí ar cíos bothán tuaithe in aice le Baile Átha Cliath, agus is amhlaidh gurbh é an file Pádraic Colum a bhí ina chónaí ansin roimpise. D'fhág sé ina dhiaidh seanchóipeanna de The Peasant agus de Sinn Féin. Foilseacháin réabhlóideacha ab ea iad seo a bhí ag éileamh go mbrisfí an nasc leis an mBreatain Mhór. Léigh an Chuntaois na hirisí seo, agus chuaigh siad go mór mór i gcion uirthi. Sa bhliain 1908, chuaigh an Chuntaois go hoscailte le polaitíocht agus le náisiúnachas. Chuaigh sí i Sinn Féin agus in Inghinidhe na hÉireann (is é sin, Iníonacha na hÉireann, i dteanga chaighdeánaithe an lae inniu), is é sin, gluaiseacht na náisiúnaithe ban. Sa bhliain chéanna, bhí sí ina hiarrthóir don Pharlaimint. Bhí sí le toghadh i ndáilcheantar Mhanchain, an áit a raibh Winston Churchill ina iarrthóir chomh maith. Chaill sí an toghchán, ach mar sin féin, ba mhillteanach an dul chun cinn agus an t-athrú saoil a bhí déanta aici. I rith dhá bhliain, d'iompaigh an Chuntaois ina polaiteoir déanta. Fianna Éireann sa bhliain 1914. Bhunaigh Markiewicz na gasóga in 1909. Sa bhliain 1909, bhunaigh sí Fianna na hÉireann (is minic a úsáidtear an leagan "Na Fianna Éireann", cé nach bhfuil sé ag teacht le ceart na teanga).Bhí na Fianna an-chosúil le gluaiseacht na nGasóg, a bhí bunaithe ag an Tiarna Baden-Powell, ach má bhí féin, bhí cuma i bhfad ní ba mhíleata ar an ngluaiseacht Éireannach, agus na buachaillí ag foghlaim úsáid a bhaint as na hairm thine, mar shampla. B'é dearcadh Phádraic Mhic Phiarais go raibh an tábhacht chéanna ag baint leis na Fianna agus le hÓglaigh na hÉireann, ar cuireadh bun leo sa bhliain 1913. Sa bhliain 1911, caitheadh an Chuntaois i dtóin phríosúin i ndiaidh di páirt ghníomhach a ghlacadh sna hagóidí in aghaidh chuairt an Rí Seoirse a Cúig ar Éirinn. Le linn an Fhrithdhúnta sa bhliain 1913, chuaigh sí in Arm Cathartha Shéamuis Uí Chonghaile, agus í ag reáchtáil cistin anraith le riaradh ar na hoibrithe nach raibh luach a mbia acu. Sa bhliain 1913, thug a fear céile a aghaidh ar an Úcráin, agus níor fhill sé riamh. Is féidir go raibh baint éigin le gníomhaíochtaí a mhná leis an éalú seo. Cibé scéal é, bhí an Chuntaois páirteach in Éirí Amach na Cásca sa bhliain 1916, mar shaighdiúir in Arm Cathartha na hÉireann, agus ghoin sí snípéir de chuid Arm Shasana. B'é a col ceathair féin a chimigh í i ndiaidh na gcathanna, agus gearradh breith an bháis di. Ós bean a bhí inti, áfach, mhalartaigh an Ginearál Maxwell pionós an bháis ar phríosúnacht saoil. Scaoileadh an Chuntaois saor ón bpríosún arís sa bhliain 1917, nuair a thug rialtas na Breataine Móire ollmhaithiúnas dóibh siúd a throid in Éirí Amach na Cásca. Faoin am seo a d'athraigh an Chuntaois a creideamh ó Eaglais na hÉireann go Caitliceachas. Sa bhliain 1918, príosúnaíodh arís í, agus an pháirt a bhí aici san fheachtas in aghaidh an choinscríofa. San olltoghchán i Mí na Nollag, 1918, vótáladh isteach ar an bParlaimint í, chomh maith le dháréag iarrthóir is trí scór eile de chuid Shinn Féin. Mar sin, bhí sí ar an chéad Fheisire mná riamh i dTeach na dTeachtaí. Ó bhí Sinn Féin ar fad ag staonadh ón bparlaimint, dhiúltaigh sí glacadh leis an suíochán a bhí bainte amach aici. Bhí an Chuntaois ar duine acu siúd a tháinig le chéile i mBaile Átha Cliath le Dáil Éireann a fhógairt an chéad uair riamh. Bhí sí ina Teachta Dála ar an Dara Dáil chomh maith, i ndiaidh an toghcháin sa bhliain 1921. Chaith an Chuntaois seal ina hAire Oibreachais ó Mhí Aibreáin 1919 go Mí Eanáir 1922, ar an Chéad Rialtas agus ar an Dara Rialtas de chuid na Dála. Bhí sí ar an chéad bhean riamh a bhí ina hAire Rialtais in Éirinn, agus níor ceapadh an chéad Aire mná eile roimh an mbliain 1979, nuair a rinneadh Aire na Gaeltachta de Mháire Geoghegan-Quinn. D'éirigh an Chuntaois as an rialtas i Mí Eanáir 1922 in éineacht le hEamon de Valera agus an chuid eile acu siúd nár ghlac leis an gConradh Angla-Éireannach. Throid sí chomh maith le duine sna hÓglaigh in aghaidh an Chonartha. Tar éis an chogaidh, chuaigh sí ag taisteal Mheiriceá. Níor vótáladh isteach í i dtoghchán na bliana 1922, ach sa chéad bhliain eile, toghadh í do dháilcheantar Bhaile Átha Cliath Theas. De réir pholasaí staonaireachta Shinn Féin, dhiúltaigh sí glacadh leis an suíochán. Thuill a dearcadh dearg-Phoblachtach seal i bpríosún di arís, agus istigh ansin di, chuaigh sise agus dháréag bhanphríosúnach eile is ceithre scór ar stailc ocrais. I gceann míosa, bhí sí saor arís. Ba chuimhin le lucht rialtais an tSaorstáit i gcónaí an náire shaolta a tharraing stailceanna ocrais na Sufraigéidí ar rialtas na Breataine Móire roimh an gcogadh. Chuaigh an Chuntaois i bhFianna Fáil a thúisce is a bunaíodh an páirtí sin, sa bhliain 1926. Bhí sí ina cathaoirleach ar chruinniú bunaidh an pháirtí in Amharclann La Scala. Toghadh ina Teachta ar an gcúigiú Dáil í i Mí an Mheithimh, 1927, ach fuair sí bás sula raibh de sheal aici glacadh leis an suíochán. Galar tobann a thug a bás. B'fhéidir go raibh sí tar éis eitinn a tharraingt ó na bochtáin a raibh sí ag freastal orthu, murarbh é an t-aipindicíteas é. In Ospidéal Sir Patrick Dun i mBaile Átha Cliath, a shíothlaigh sí. Gan phingin a bhí sí i ndiaidh a hacmhainn a thabhairt do na bochtáin. hAdhlacadh í i Reilig Ghlas Naíon i mBaile Átha Cliath. Is é "Markievicz" gnáthlitriú a sloinne a úsáidtear in Éirinn sa lá atá inniu ann, ach is é an litriú a úsáidtear sa Pholainnis ná "Markiewicz", nó is mar v an Bhéarla a fhuaimnítear w na Polainnise. Nuair a scríobhadh an chéad bheathaisnéis Polainnise fúithi, ba é an leagan a d'úsáid an t-údar ná Konstancja Markiewiczowa. O'Faolain, Seán (1934). 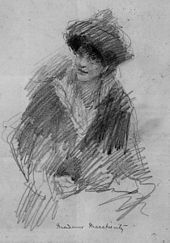 "Constance Markievicz". Lawlor, Damian (2009). "Na Fianna Éireann and the Irish Revolution- 1909–1923". Marreco, Anne (1967). "The Rebel Countess: The Life and Times of Constance Markievicz". Norman, Diana (1987). "Terrible Beauty: A Life of Constance Markievicz, 1868–1927". Haverty, Anne (1993). 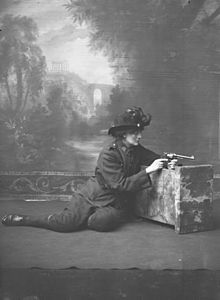 "Constance Markievicz: Irish Revolutionary". McGowan, Joe (2003). "Constance Markievicz: The People's Countess". Van Voris, Jacqueline (1967). "Constance de Markievicz: In The Cause of Ireland". ↑ Ward, Margaret (1983). "Unmanageable Revolutionaries: Women and Irish nationalism". London: Pluto Press. ↑ Irish Freedom, August 1912. ↑ Depuis, Nicola (2009). Mná na hÉireann: Women who Shaped Ireland Corcaigh: Mercier Press Ltd. Lch. 171. ISBN 9781856356459. Arna rochtain ar 26 Iúil 2014. Tugadh an leathanach seo cothrom le dáta an 4 Feabhra 2019 ag 09:49.